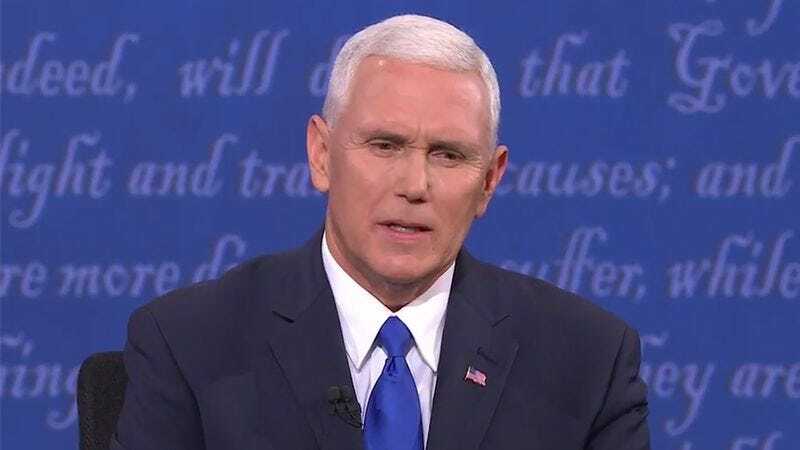 FARMVILLE, VA—Taking a deep breath and reminding himself to focus on his visualization exercises, Republican nominee Mike Pence reportedly calmed his nerves during Tuesday night’s vice presidential debate by imagining the entire audience burning in hell. “It’s okay, Mike; it doesn’t matter that tens of millions of people are watching—just collect your thoughts for a second, look out at everyone in the crowd, and picture each one of them being flayed alive as their skinless bodies boil in a lake of unquenchable fire,” the Indiana governor reportedly thought to himself, noting that, so long as he envisioned those in attendance being repeatedly impaled on pikes and disemboweled by hordes of demons, all his anxieties would melt away, and he could focus on delivering his responses with calmness and composure. “Just imagine the swarms of hungry maggots pouring from their orifices and the blackened flesh sloughing off their charred bodies. Good, good. Now, picture [moderator] Elaine [Quijano] being set upon by dozens of venomous asps as she screams in agony for all eternity. That’s it; perfect. You got this, Mike.” At press time, a visibly relaxed Pence was confidently explaining why women’s health services should be permanently defunded.